A fun blog about food and family! Top ‘o the morning to you! It’s St. Patrick’s Day. I’ve been wearing green since yesterday because if I don’t wake up wearing green then I get pinched first thing in the morning. That is NOT the way to start your day. Trust me, I speak from experience. 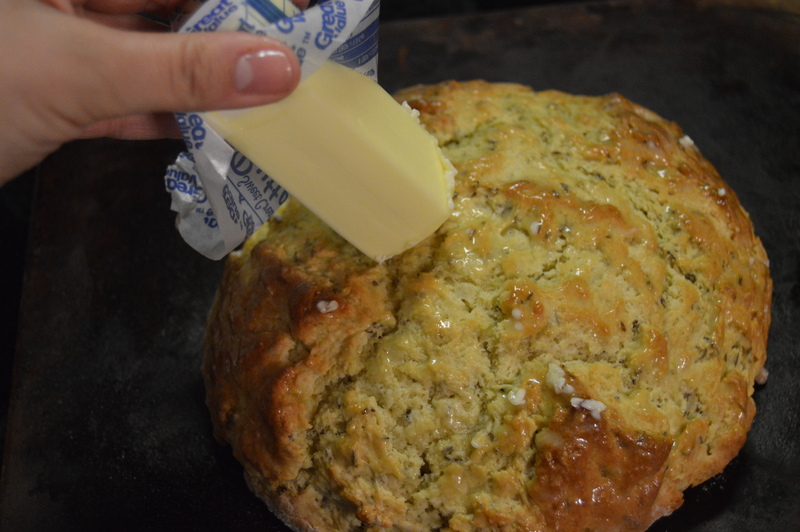 Today I’m bringing you a recipe for Irish Soda Bread. 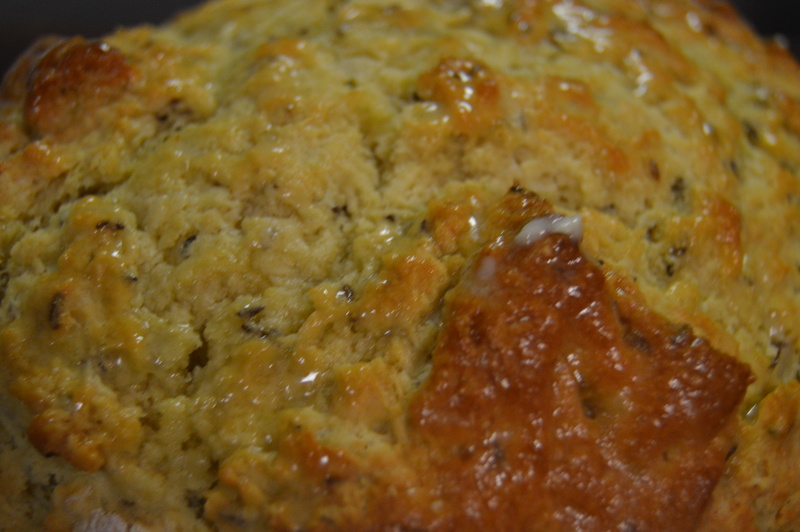 You’ll notice that I called it sorta-Irish Soda Bread. That’s because the bread that we’ve come to think of as “traditional” is not Irish at all. There is an actual Society for the Preservation of Irish Soda Bread and they go into all the details. Suffice it to say that in Ireland they would scoff at what we call Irish. Actual soda bread is very simple and consists of four ingredients: flour, salt, buttermilk and of course baking soda. We Americans, being who we are, can’t help ourselves and have Americanized traditional soda bread by adding butter, eggs, dried fruit, carraway seeds and sometimes even nuts. 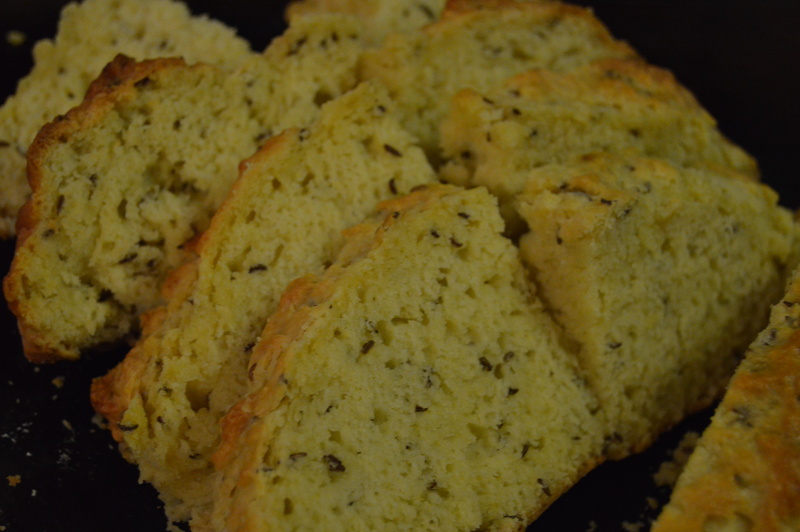 My recipe is much more Americanized because I didn’t want just a plain bread. So sue me, I like flavor! My recipe is adapted from Brother Rick Curry’s book The Secrets of Jesuit Breadmaking. 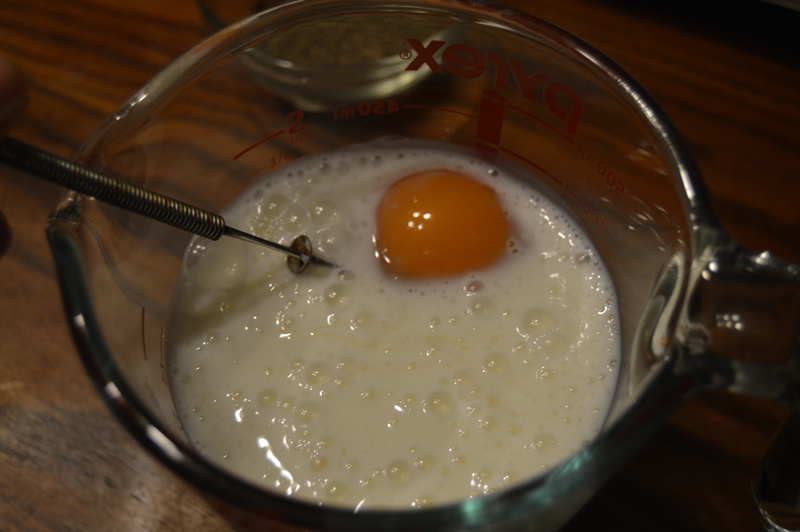 Add one egg to the buttermilk. Give it a good whisking until it’s combined and a lovely yellow color. 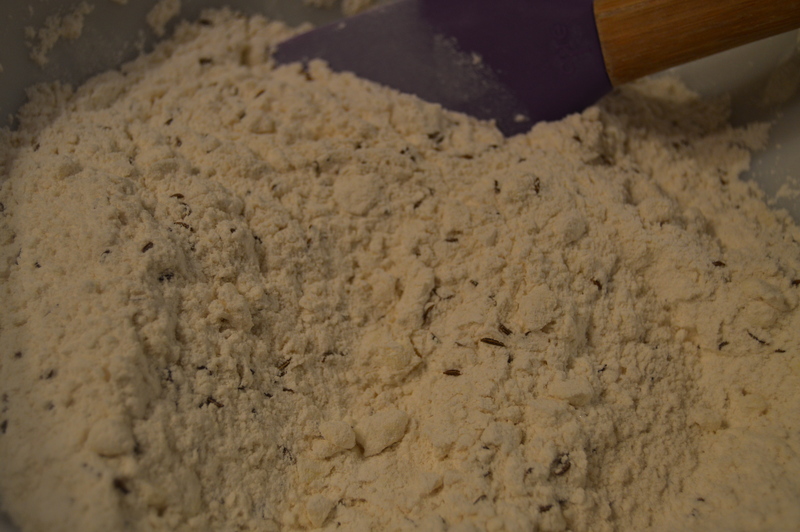 Combine all your dry ingredients in a bowl. Whisk to combine (I really like whisking things). 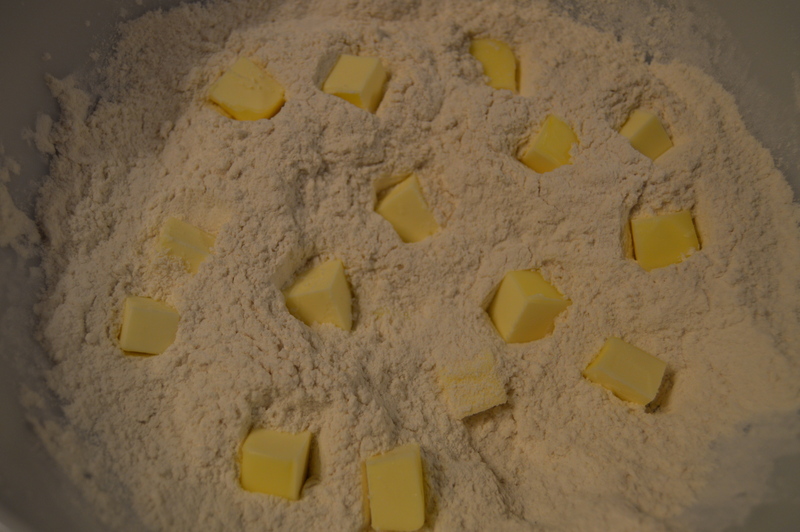 Dot your butter around in the flour. Give it a good toss and cut it in using your pastry blender or fingers. Stir them in. Notice how I said stir this time instead of whisk? 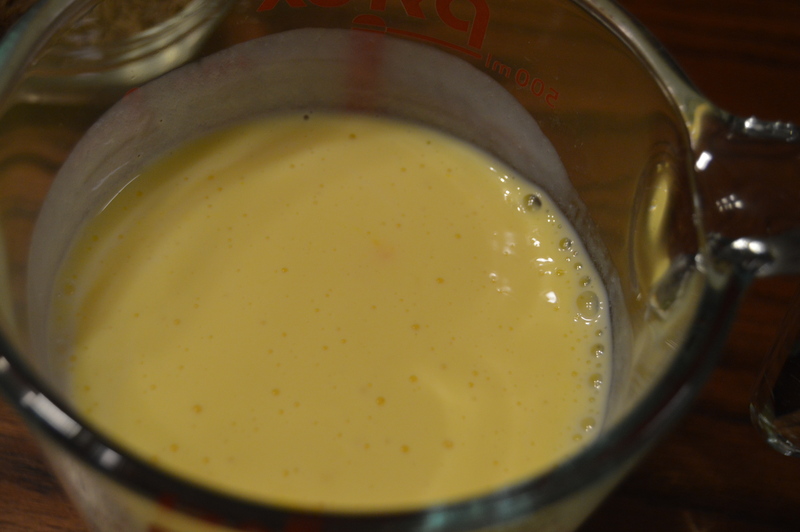 Now it’s time to add the buttermilk-egg mixture. I started off adding only part of it and stirring but it was too dry. I intended to use only what I needed to make the dough come together and I would get rid of the rest but I got impatient and dumped it all in. I should have been more patient. My dough was WAY to sticky!!! No worries though! I was able to salvage it! GENEROUSLY flour your work surface. 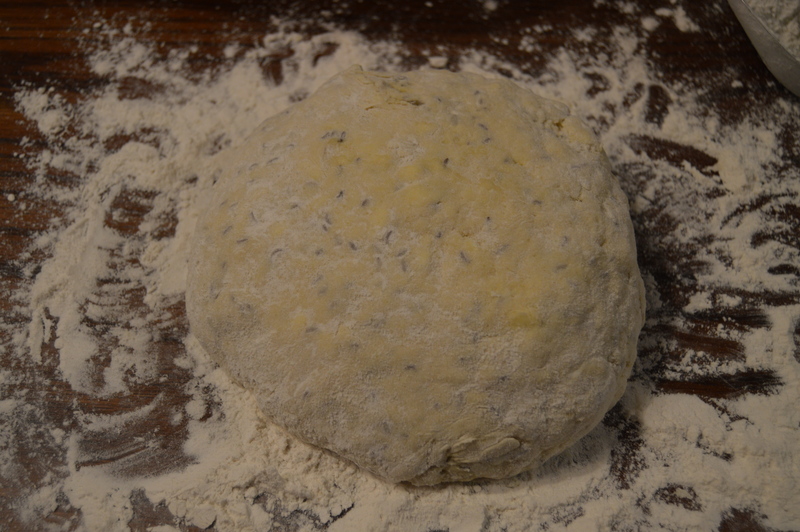 Turn the dough out onto the surface and generously flour that too. 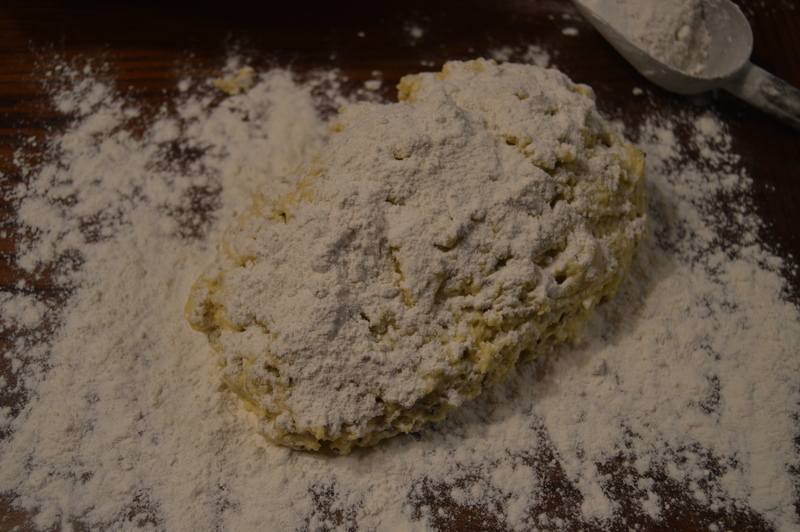 I kneaded the dough until a lot of the flour had been worked in and I had a nice firm-ish dough. Be careful not to knead too much though or you’ll end up with tough bread. Cut an X in the top. You can put yours in a pie plate or cake pan. I chose to use my baking stone! The dough was still pretty soft but in the end it didn’t matter! Add a little butter for flavor and moisture. 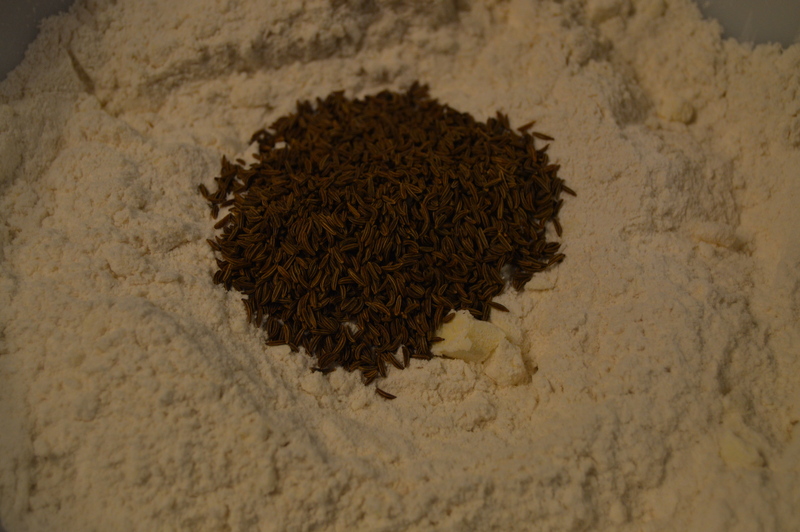 You can see the caraway seeds throughout. They gave the bread such a nice flavor but it wasn’t too overpowering. Serve it up with lots of butter! Preheat oven to 350 degrees. 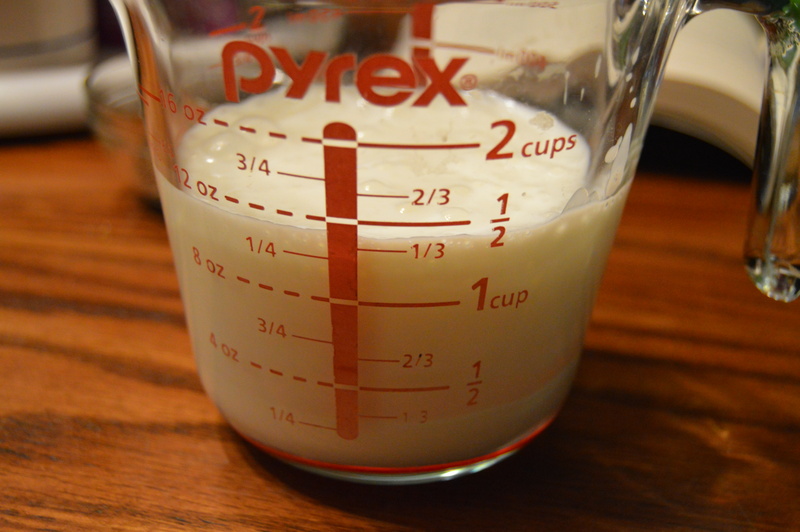 Whisk your butter milk and egg together in measuring cup or bowl. Set aside. In large bowl, combine all of the dry ingredients. 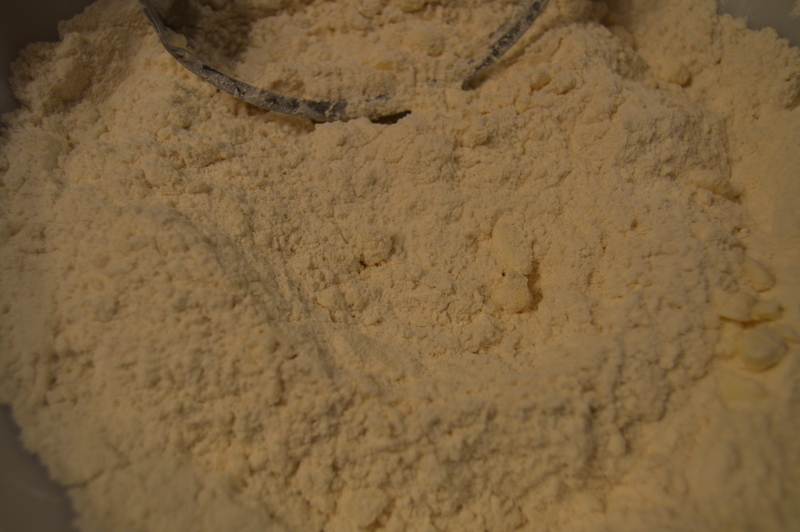 Dot the butter around on top of the dry ingredients and give it a good toss to coat it. 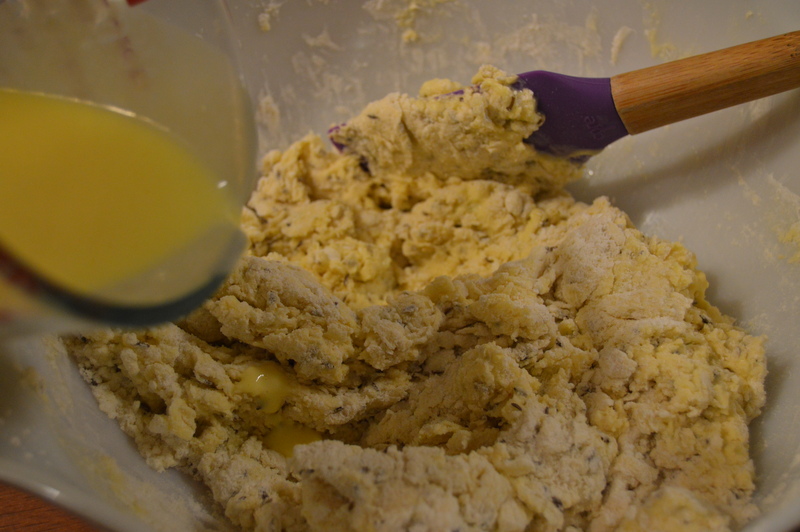 Using a pastry blender or your fingers, cut the butter into the flour until it resembles large crumbs. 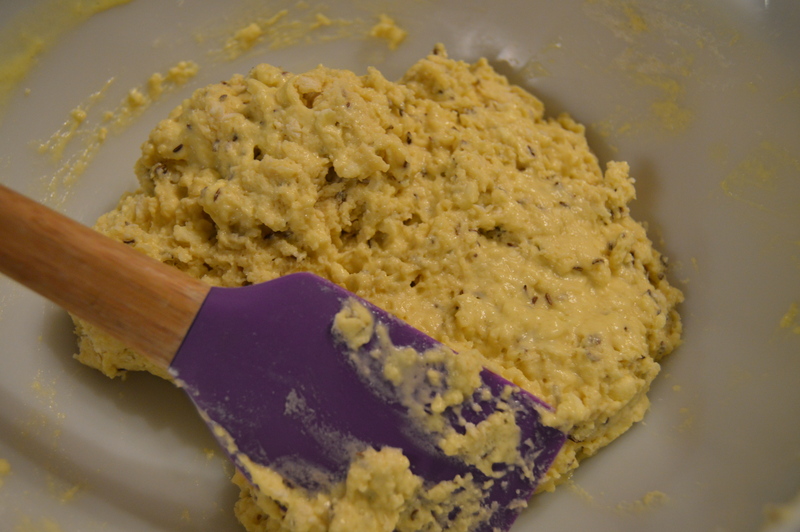 Add your wet ingredients and stir until it is well combined and a stick dough is formed. 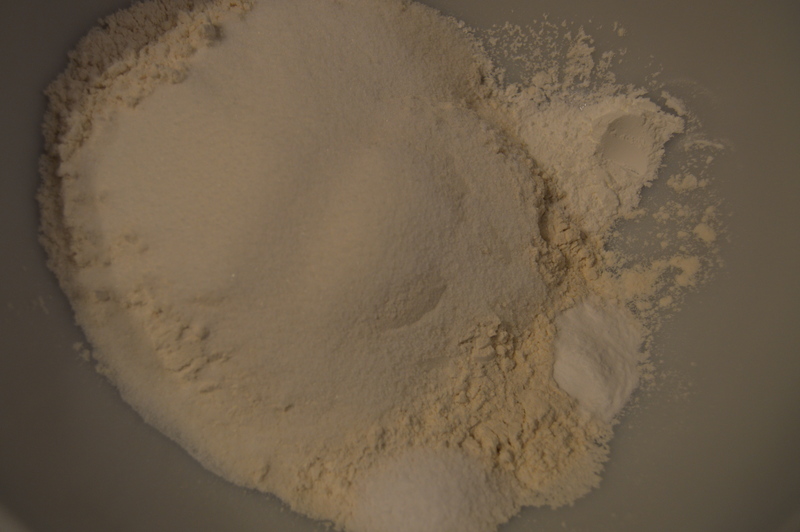 Flour your work surface and turn out the dough onto the surface and flour the dough generously. 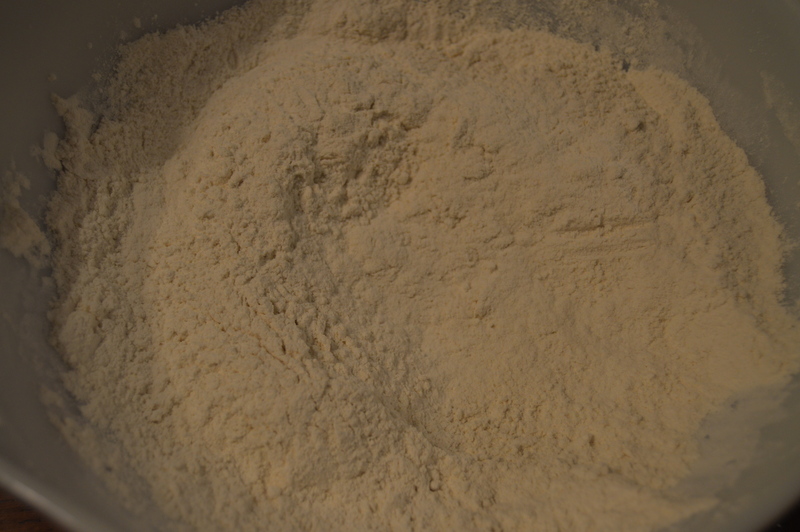 Knead the dough until the flour is incorporated and the dough is more firm. Be very careful not to over-knead the dough or your bread will come out tough when it should be very tender. 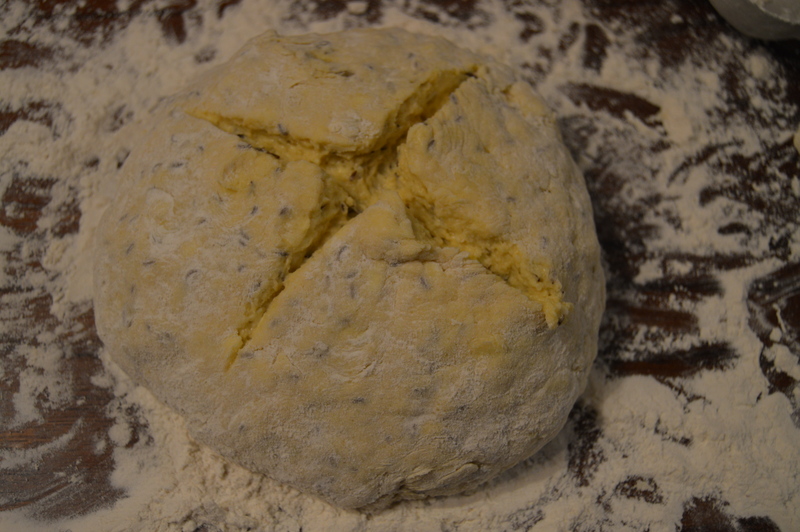 Shape dough into a flat ball and cut and ‘x’ in the top. 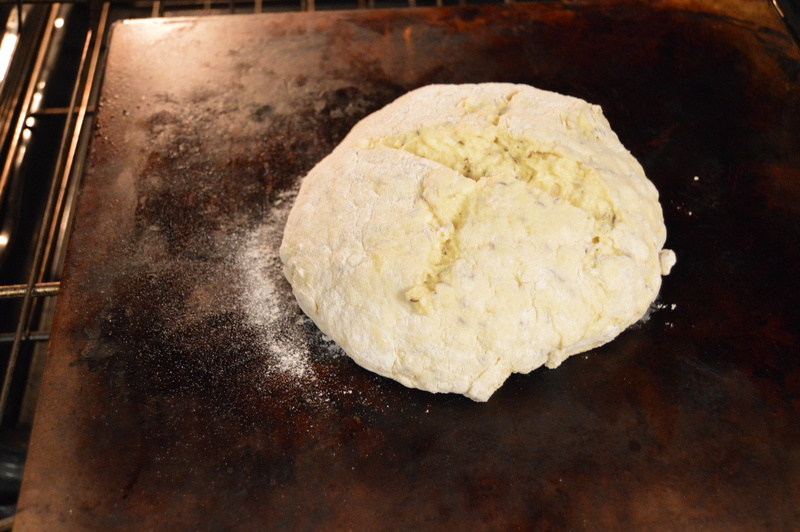 Transfer to preferred baking pan (pie or cake pan, baking stone) Bake bread for 45 minutes. Check for doneness by inserting toothpick in middle. Toothpick should come out clean. Generously butter the top of the bread while still warm. Allow to cool before slicing. Notes: This dough is a very wet dough. Brother Rick bakes his a loaf pan so the wetness doesn’t matter. If you choose to go this route, bake for an hour. I wanted a more traditional style loaf so I chose to bake mine on a stone. Next time, I would reduce the buttermilk by a 1/4 cup so it wouldn’t be as sticky and wouldn’t need kneading. Happy St. Patrick’s Day Everyone! Don’t forget to wear green. Click here to follow Babydoll Bakes and get all the latest recipes delivered to your inbox!